Take your holiday relaxation to a whole new level in the incredible Terrace Club Suite. Enjoy spacious and luxurious living with generous sized rooms of 94 square meters and boasting the largest balcony of the hotel's suites range. Experience scenic panoramas of the Arabian Sea or The Palm Island while you sunbath or dine in complete privacy on the fully-furnished terrace complete with sun lounges and dining set. 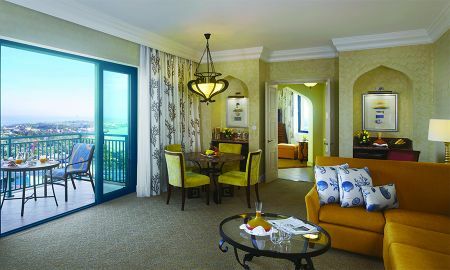 For families who want to live the suite life, experience everything that Atlantis has to offer by staying in the Executive Club Suite. Relax, unwind and feel right at home in this beautifully furnished suite of 101 square meters, featuring an expansive living and dining area. Take a quiet moment out on the balcony to take in the breathtaking views that can only be experienced from the viewpoint of Atlantis. 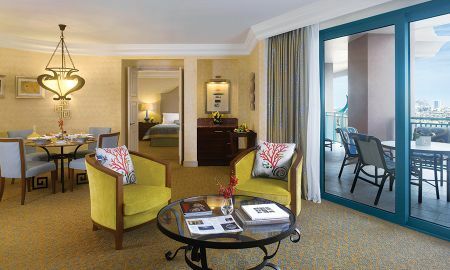 Go beyond the depths of luxury and book your stay in the Regal Club suite for the full royal experience. Spanning 164 square meters, this lavish suite features plush, spacious living areas, a large balcony with sweeping views and a magnificent master bedroom with its own majilis. The grand en-suite will is sure to take your breath away, featuring a free standing oval jacuzzi and chaise lounge creating a space for absolute relaxation and indulgence. 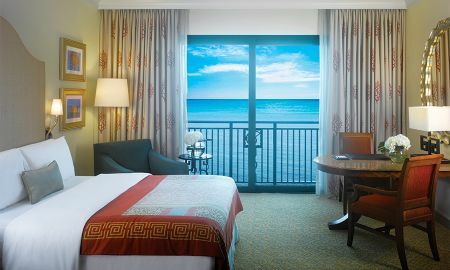 This room offers unlimited complimentary access to Aquaventure Waterpark and The Lost Chambers Aquarium, and 1 complimentary afternoon session at Kids Club or Club Rush for teens. This room offers unlimited complimentary access to Aquaventure Waterpark and The Lost Chambers Aquarium, and 1 complimentary afternoon session at Kids Club or Club Rush for teens. Please note that there is a balcony for King Size Rooms and a French balcony for Double Queen Rooms. - Complimentary breakfast, afternoon tea and evening drinks. 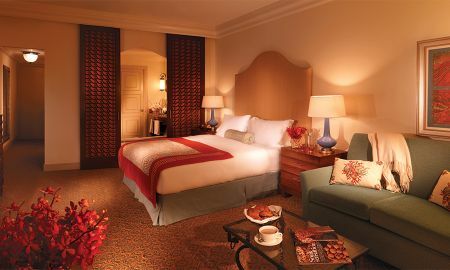 - Complimentary high-speed internet and access a library of newspapers and magazines using dedicated Lounge iPads. - Dedicated check-in & check-out lounge. - Exclusive access to the Imperial Club Beach and ShuiQi Spa’s state-of-the-art facilities. - Complimentary roundtrip airport transfers from Dubai International Airport. Please contact the property 48 hours in advanced to confirm transportation. Nestled on Palm Jumeirah Island, the 5-star Atlantis The Palm showcases its own private stretch of beach and spectacular views of the Gulf. 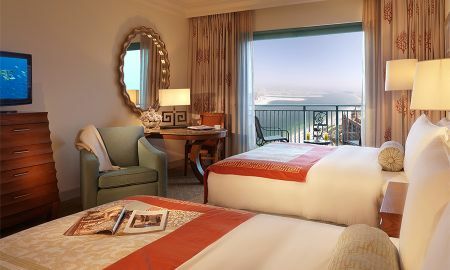 Each of the elegant accommodations features an Arabian ocean décor, a balcony with scenic views, a seating area and state-of-the-art amenities. Outstanding international dishes, from Japanese to Lebanese cuisines, are often prepared by celebrity chefs at the range of on-site restaurants, ensuring the perfect venue for any occasion. The swim-up bar promises relaxing refreshment, while the night life options provide the perfect evening entertainment. Inspired by the legendary lost city of Atlantis, the underwater wonderland of Lost Chambers boasts a maze of themed halls and tunnels with close-up views of 65,000 marine animals from around the world. Animal-lovers can even participate in ray-feeding. As the largest water park in the Middle East, the 42-acre Aquaventure offers water slides, river rides and a children's water playground within its lush tropical landscaping. Thrill-seekers will love The Leap of Faith, which will send them speeding through a clear acrylic tube surrounded by sharks and rays. The all-new Tower of Poseidon is packed with record-breaking water slides and the region's longest zip line circuit. Dolphin Bay boasts shallow-water dolphin interaction experiences, as well as deep-water dolphin swims. Guests can indulge in the luxurious Spa Shuiqi, a paradise of well being and relaxation. The Spa offers a wide range of treatments, massages and therapies, as well as unique yoga sessions in an aquatic setting at the Lost Chambers Aquarium. ShuiQi Fitness Centre features the latest-generation equipment and a team of personal fitness coaches for an unforgettable work-out. 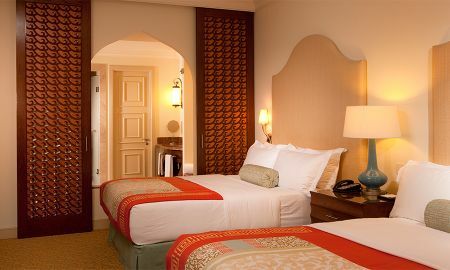 Atlantis The Palm offers also 2 outdoor pools, a children's pool and child-friendly activities, as well as exclusive boutique shopping opportunities. Sports-enthusiasts can enjoy a game of squash or tennis, and exciting water sports such as kayaking, snorkelling, and surfing. 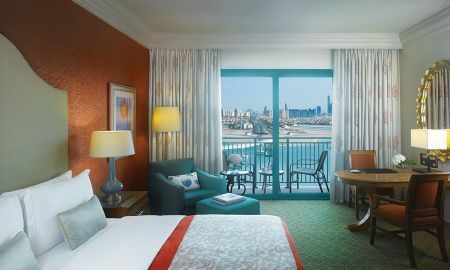 Just 3.2 kilometres from the Emirates Golf Club, Atlantis The Palm is a 20-minute drive from the Mall of the Emirates, and a 25-minute drive from the iconic Burj Khalifa and The Dubai Mall. Guests are 45 minutes away from Dubai International Airport. For bookings between December 26th and January 6th, the hotel can charge the remaining balance 45 days prior to arrival. Please note there is a mandatory New Year’s Eve Gala Dinner on 31 December and it's not included in the room rate. 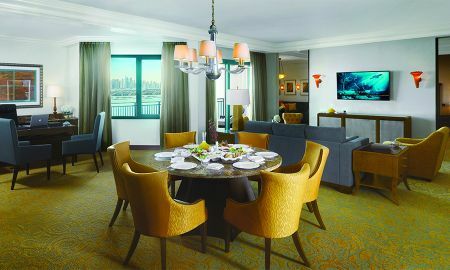 Guests 21 years and above are charged AED 2900 per person. 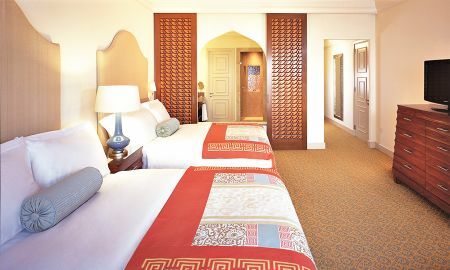 Guests from 12 up to 20 years are charged AED 2030 per person. Guests up to 11 years are entitled to dine free of charge. Please note that guests who book the Imperial Club Room and want to use the airport transfer services must book their transportation 72 hours before arrival date. Complimentary massage at ShuiQi Spa when a second massage is purchased.